The Synergy Detox Max Cleanse detoxification system is designed to temporarily reduce toxin levels in your urine so they fall below detectable levels in a laboratory urine drug test. Designed for the heavy user (5+ times time per week) with body weight over 160 lbs, or moderate user (2-4 times per week) over 190 lbs. If your a heavy user and weigh under 160 lbs., please use our Power Flush product. The Max Cleanse temporary detoxification system gives you up to a 6-hour window to pass a urine drug test. 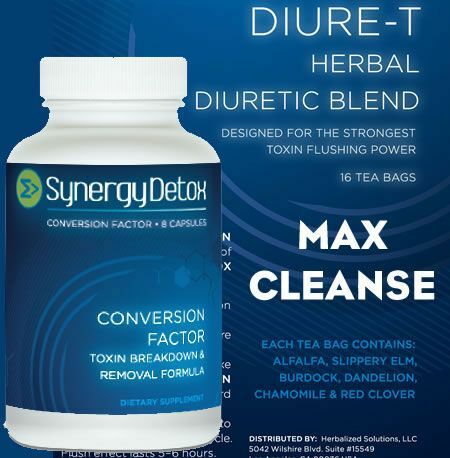 Temporary detoxification with Max Cleanse is achieved using 16 Diure-T tea bags and the Conversion Factor supplements. Diure-T is a safe, herbal diuretic. You'll brew and drink Diure-T over a time span of two hours, as you take the Conversion Factor capsules. These capsules flush out the toxins and restore essential nutrients to the urine temporarily. After completion of the program, you'll be able to pass a urine drug test within a 6-hour window. Max Cleanse is ideal for people with a usage of over five times a week (Heavy user) and a body weight of over 160 lbs. It is also ideal for people with a usage of two to four times a week (Moderate user) and a body weight of over 190 lbs. Heavy users with a body weight of less than 160 lbs should use the Power Flush detoxification system. Synergy Detox cleansing is done using natural herbs and vitamins. The Max Cleanse temporary formula has been tested thousands of times with passing results. It's undoubtedly the healthiest and most powerful way to temporarily flush out toxins from your body in order to pass a urine drug test.